My twin daughters have finally reached an age where they're not quite so destructive. As babies, they scribbled on walls, pulled down curtains, and knocked over anything that wasn't nailed to the floor. Now that they've turned 5, they're old enough to help with chores. With a little nagging from me, they make their own beds and put away their toys. They haven't destroyed any closets lately or emptied 500 boxes of board games all over the floor. I had to go and get a puppy. 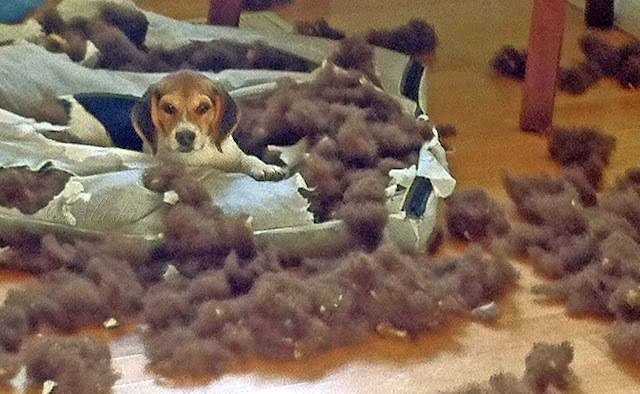 Lupine peed on her bed, so I removed the outer cover to wash it. I never dreamed she would literally TEAR APART the mattress. I'm trying not to panic, but I'm freaked out by that stuffing. I'm pretty sure it's human hair. Ohmygosh. Just the kind of thing you want to find when you walk into a room. When will we ever learn? When you least expect it, expect it. If you said that your house was invaded by gray hamsters and showed me this picture to prove it, I would have believed you! Oooh, bad puppy. But still so cute. Human hair mattress filling? Gross. We just got a puppy two weeks ago. While his teeth right now are too little to do any real damage, I'm scared for this scenario in the future! He likes to bite at his bed! I was just joking about the human hair, although in my defense, it LOOKS and FEELS a lot like it!! Maybe it's the same stuff they use for doll hair . . ? I don't know what it is, but it's freaky.